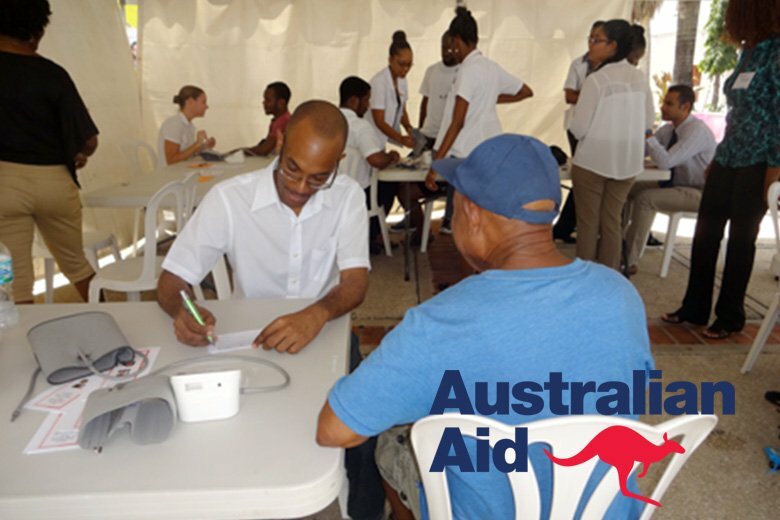 Australian Government’s Direct Aid Program (DAP) to fund the Blood Pressure Control through Community Action Phase I (BPCCA I) multi-country project. In an effort to tackle hypertension, one of the most important preventable causes of premature mortality worldwide and in the Caribbean, the HCC has been awarded a grant from the Australian Government’s Direct Aid Program (DAP) to fund the Blood Pressure Control through Community Action Phase I (BPCCA I) multi-country project. The HCC will manage and oversee BPCCA I, a health care delivery improvement programme, consisting of projects undertaken by civil society organisations, in five CARICOM countries. The aim of the project is to assist civil society organisations in undertaking best practice screening of blood pressure and identification of hypertension, and provide further support to these organisations to allow them to contribute more effectively to strengthened health systems around the treatment of hypertension, resulting in better blood pressure control. GSHTPThe project will be undertaken applying Global Standard Hypertension Treatment (GSHTP) approaches and principles together with other relevant international best practices. The beneficiary populations of the initiative of improved detection and improved management of hypertension are those that are undeserved and disadvantaged. HCC President, Sir Trevor, in a recent meeting with His Excellency, High Commissioner Ross Tysoe, remarked that civil society have an important tramadol cod cash on delivery role to play in addressing hypertension control, especially in the Caribbean where hypertension occurs in 24.0% – 37.5% of adults age 25 – 64 years. The HCC is grateful for the continued support of the DAP which has made a significant impact on civil society led cervical cancer control efforts in the Caribbean under the previous grant (C4PI – 2014). We look forward to even greater success in BPCCA I as we seek to strengthen the community-based contribution to hypertension control in the Caribbean.